According to witnesses at the zoo’s Elephant Outpost, Donald Trump Jr. told his son to aim for a calf that had wandered away from its mother in search of a play partner. WASHINGTON—In what he referred to as an important rite of passage for his 8-year-old son, Donald John III, Donald Trump Jr. took his eldest boy to the Smithsonian National Zoological Park for his first-ever hunting trip, sources said Wednesday. 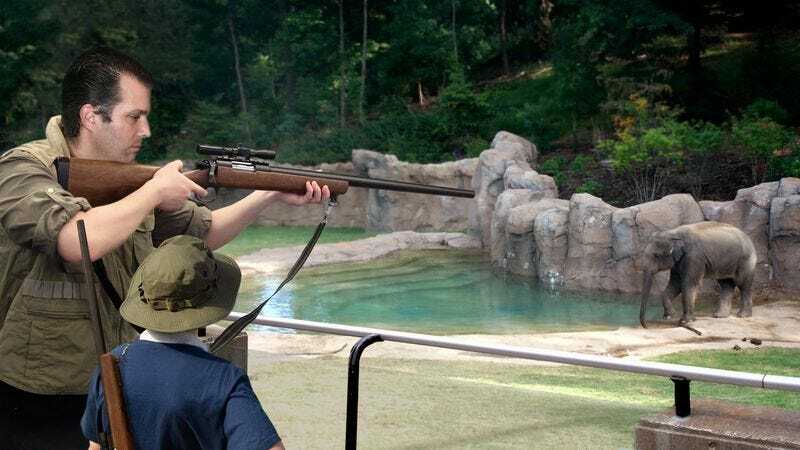 The daylong excursion, during which father and son could be seen wearing matching khaki fatigues and safari hats, was reportedly an opportunity for Trump Jr. to introduce the young boy to hunting by showing him how to track a wild animal through a zoo exhibit, set up the perfect shot just outside a fenced enclosure, and, if possible, hit the target right between the eyes as it lies sleeping. According to sources, Trump Jr. and his son crept quietly along the paved footpaths—staying low and occasionally ducking behind an information kiosk—in the hopes of remaining undetected as they approached their next targets, Wilma and Zora, the two American bison housed by the zoo. Both animals were reportedly lapping water from a trough and caught unaware, allowing the father-son duo to take each of them out with three quick shots to the head, use a bowie knife to cut off the horns for souvenirs, and then continue on their way to the picnic pavilion for hot dogs and sodas. Arriving at the zoo’s bird sanctuary, the Trumps are said to have switched from big-game rifles to scatterguns, bringing down a dozen flamingos, five whooping cranes, and a pair of North Island brown kiwi as zoo employees and families in the nearby gift shop screamed and ran for cover. Reports confirmed the highlight of the expedition came when Trump Jr. took down the zoo’s giant panda Tian Tian with just two shots, the first bullet shattering the Plexiglas barrier and the second hitting the animal directly in the heart. The Trumps reportedly took the opportunity to pose with their prized trophy, each triumphantly placing a foot on the blood-drenched panda as a hired photographer captured the moment. The jubilant father and son reportedly ended their day by honing their marksmanship at the Small Mammal House, picking off mongooses one by one as they poked their heads out of their burrows. At press time, having deemed a gazelle carcass too small to make a good wall mount, the Trumps had abandoned the dead animal near a lemonade cart to rot in the sun.